After enjoying 2 full zero’s in South Lake Tahoe, where I rest up and eat lots, it is time to hike out again. The next section will take me from Echo Lake to Sonora Pass/Highway 108, which is 76 miles in total. A piece of cake for this experienced hiker! I set out on a clear Saturday morning from Echo Lake. Dutchess drops me off and we say goodbye, again. But we will meet each other on Monday, at noon, at Sonora Pass, where he will bring me my resupply for the next 104 mile stretch. I hike out at 7 am. The sky is clear and it’s a gorgeous sunny day. I still have to get used to hike by myself. I feel lonely and sad about the fact that I don’t have my hiking buddies around. But I know this is my practice. I’m learning and willing to accept what is. What I receive every day. And how fortunate I am to be here in this awesome landscape. Everyone I met on trail told me about the High Sierras. How beautiful it is. How rugged, remote and vast it is. 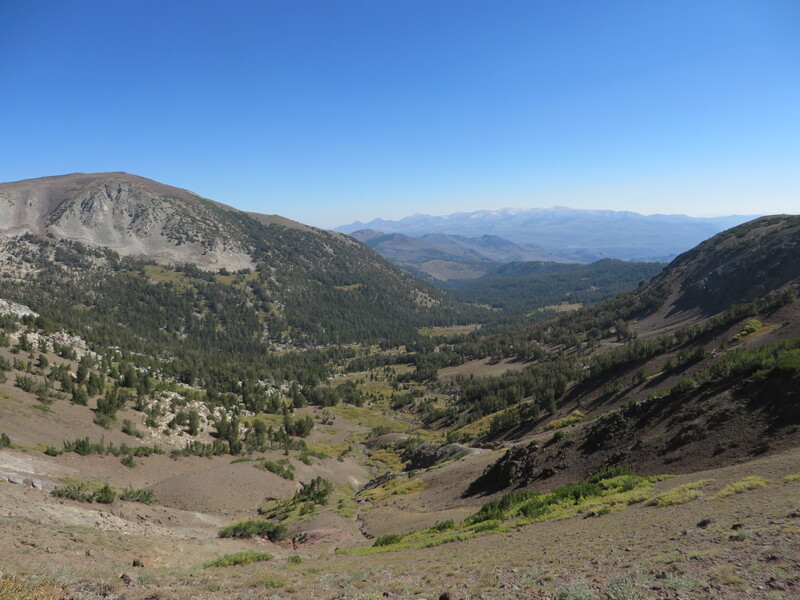 The most amazing part of the Pacific Crest Trail, the best landscape America has to offer. And I’m about to enter that area. I’m psyched and feeling grateful for that. For this moment. Thank you, thank you, thank you, I say aloud. At noon, I arrive at Carson Pass, where there is a little ranger station. I chat with the rangers and cook a little hot lunch. When they find out I’m hiking to Mexico, they offer me sodas and snacks. Awesome! “It might rain on you today”, one ranger says, looking at the clear blue sky. “Yeah, they said a big storm is coming in today”, the other one says. I look at the same clear blue sky. It’s hard to believe that. After the break I pack up and I’m off hiking again. I have my phone stuffed with new music and I blast my tunes while setting off. A ranger who passes me asks me to turn down the volume, so I won’t disturb the other hikers. “Sure”, I say, giving him my loveliest smile. When he’s out of sight, I turn up the volume. How else am I going to climb all these mountains without having my friends around!? Then, around 4 pm, all of a sudden, the sky turns grey. Okay, nothing to worry about – yet. I keep on hiking. But then the thunder starts. I’m on this ridge, super exposed and there’s nothing, absolutely nothing to hide under. I hike, as fast as I can. But the trail keeps on climbing. 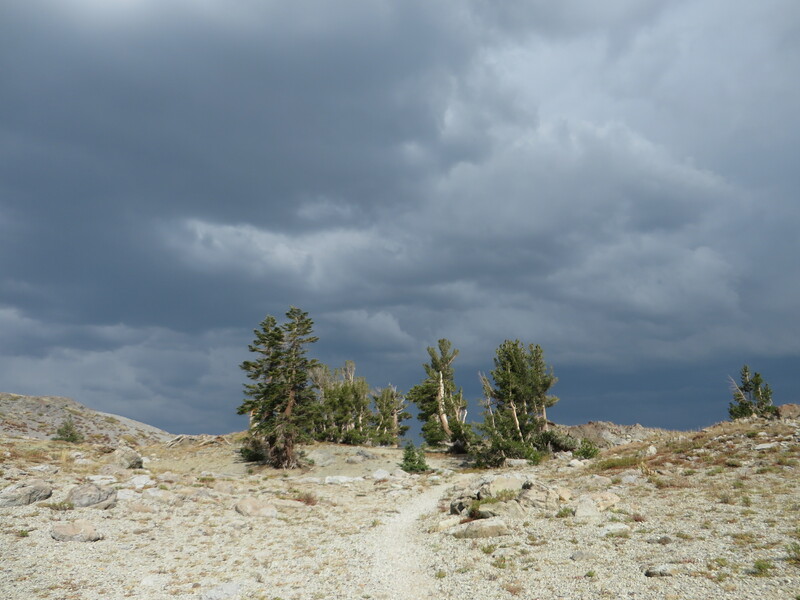 There are no trees, only rocks, a trail and a sky that turns almost black now. It starts to hail. Huge hailstones are shooting down on me with full speed. Ouch, that hurts big time! I’m in the middle of the thunderstorm now. I look frantically around. I see a little notch off trail and I throw my (aluminium) trekking poles far away from me, take off my pack and make myself super small. I wrap my arms around my legs and bow my head down. The thunder is right above my head, the lightning comes in every 10 seconds and thunderclaps a few seconds after the lightning. I start crying out of despair. I’m scared. Why do things like this happen when I’m all by myself? I feel so alone right now. It keeps hailing for a good hour. Then, the storm passes. I lift up my head and look around. It looks like it has been snowing. The mountain is white of all the hailstones. I’m totally soaked and freezing cold. My cheeks still wet from my tears. I know I have to get down this ridge and find myself a flat spot to pitch up my tent and get warm, fast. I start hiking. My hands are so cold I can’t even move my fingers. The trail finally descends down and in the forest I find a good spot to camp. I need to get warm right now. Luckily my sleeping bag and sleeping clothes are still dry. I strip off my wet clothes and put on my dry ones. I cook a hot meal. Finally I feel a little warmer. I worry about my miles. Because of the thunderstorm, I was not able to hike all the miles I was aiming for today. I try to let my worries go and trust that it all works out, that I will make Sonora Pass in time on Monday. I listen to one of the Radiolab podcasts on my phone to keep me company. I fall into a deep sleep. When I’m hiking out in the early am on Sunday, I meet a rare northbound hiker. We chat for a little while. His name is Coach and he is in his 70’s. He’s still maintaining an active lifestyle and I cannot do otherwise than rooting for him. It is just so cool to meet such interesting people like him. I tell him I’m meeting my friend at Sonora Pass the next day at noon. Coach says: “My God girl, that’s 50 miles from here! You are never gonna make it.” “Well you know what Coach”, I say. “I know I will.” He takes a good look at me and nods his head. “You know what. I think you will too, he says. I manage to hike around 30 miles that day. It’s dark when I pitch up my tent near Murray Canyon Junction. I cook my dinner and count the remaining miles to Sonora Pass. I still have another 20 to go. 20 miles before noon, that is. I decide to hike out early the next morning and count the stars when I lay in my sleeping bag before falling to sleep. The alarm wakes me up at 4 am. I’m slowly waking up to a pitch dark forest. I’m on the trail at 4.30. Phew. Here we go! I’m destined to make it to Sonora Pass at noon, but I have still 20 miles left, and I have only 7.5 hours to do it. With a big elevation gain as a bonus. Nice! Hiking in these dark hours feels comforting in a way. The world still asleep. Millions of stars above me. My headlight (I brought extra batteries this time!) is my beacon. I eat breakfast as I hike, which consists of a few energy bars and water mixed with Gatorade powder. Daylight welcomes me at around 6.30. The view behind me as I’m climbing out of the canyon towards Sonora Pass. Almost there! At 11.55 am, I arrive at Sonora Pass. 5 minutes too early! Dutchess is not here. There is no sight of his car. A trucker who’s enjoying his break at the Pass tells me to give the good guy 5 minutes. It’s not noon yet. At 11.58, a red car arrives at the trail head. It’s Dutchess! Such great timing! We have lunch at the Pass, eat and catch up in the sun. What an awesome day this is! ← Pacific Crest Trail Chapter II: Back in California!